Many Southeast Asian cultures have their own stories and culinary love affair with the liquid green of jade, the alluring fragrance of a wild flower, and the sweet, nutty and vanilla taste that comes from pandan leaf or Bai Toey, a member of the screwpine family of plants. 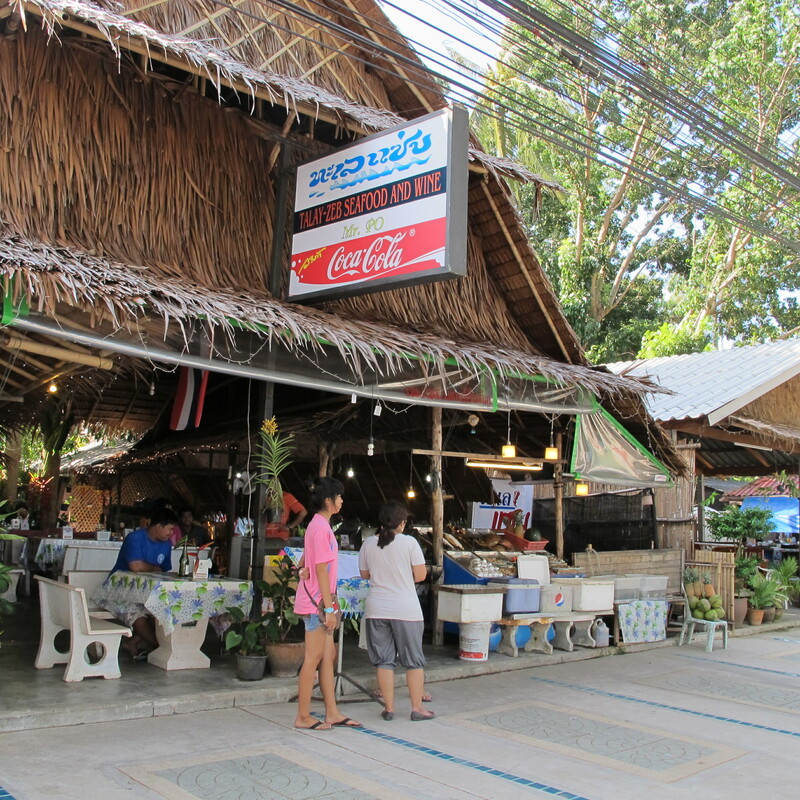 I have stories of my own about helping my mom and three aunts prepare dessert each morning in order to supply the villagers’ demands for Thai desserts for breakfast at the local coffee shop. That was a long while ago, but today in Seattle I still practice my culinary heritage by adding this jade green water extract to many foods that I cook. 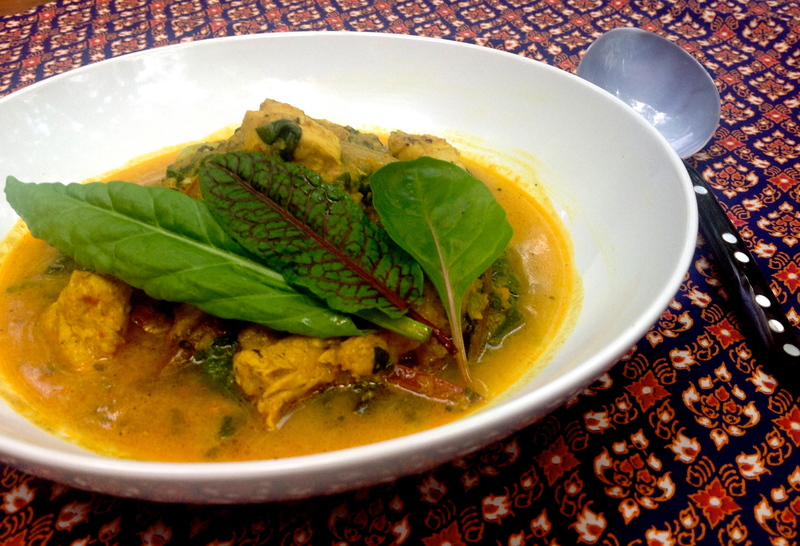 No matter how far people are from their homeland, or how long they have been gone, the Thai culinary tradition of using Bai Toey – ใบเตย – is staying alive among those native to the cuisine. Pandan leaf, or Bai Toey, is known in Vietnam as La Due, and in Malaysia as Kaitha, to mention a few. Pandan leaves give our kitchens a sweet, alluring fragrance, and the lingering of a sensational taste. Don’t be surprised by its deep green grass aroma when it is in its fresh state. When combined with palm sugar and coconut milk, or when cooked, it leaves behind an amazing taste that can surprise you with the excitement of a new culinary discovery. Fortunately, green pandan leaves are available at a reasonable price, either fresh or frozen, at Asian markets, so there is no need to miss out on this culinary tradition. Before you go any further, I hope you have a chance to first read my blog post on Pandanus leaf – Bai Toey from years ago. It includes a Pandan-Jasmine Tea recipe and will give you an insight into Bai Toey and the ways it imparts its taste, aroma and color into Thai desserts and beyond. For my Thai Street Food series of classes, I prepared enough pandan custard with brioche for myself and the class, and indulged myself for breakfast. But it is not yet time for me to share the pandan custard recipe, nor other uses for the leaves. Today’s post will simply focus on the crucial step of making of green pandan water -น้ำใบเตย – Nam Bai Toey, an essential ingredient in many Thai desserts. The food photos above and below are from my own collection over the years, mostly from my visits to Thailand. 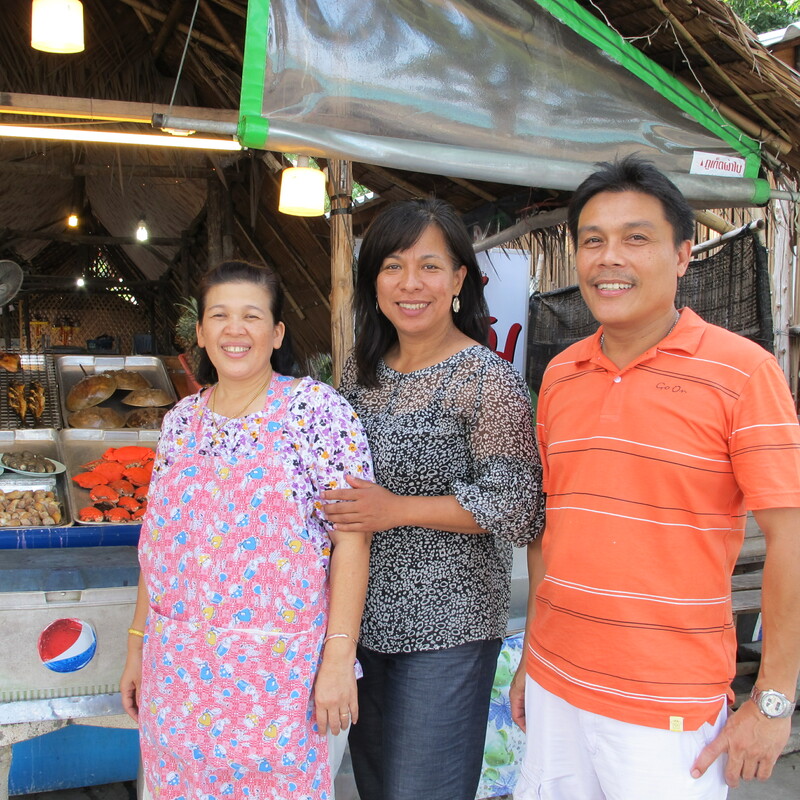 The foods came from street foods venders, coffee shops, or my village market. The green color in all of them is from pandan water. When cooked, the jade green color can change to celadon or mantis green—how deep a green depends on the amount of leaves used. Pandan custard -สังขยาใบเตย- Sangkaya Bai Toey is a traditional custard that is used like a spread or dip. In Seattle, pandan leaf – bai toey – is available fresh or frozen at Asian Markets and comes in a package of six leaves. For green food coloring, I recommend that you use all six leaves and freeze any extra juice—the greener the better. I have been making many Thai desserts the last few months and have been using a lot of pandan leaves. For some desserts, the complete flavor profile is very dependent on the pandan flavor. One of these is sungkaya – Thai custard; I have added my favorite pandan custard – Sungkaya Bai Toey – to my Thai Street Food class. Clean, dry and trim four pandan leaves. Cut each leaf into three pieces, then layer them in a pile. 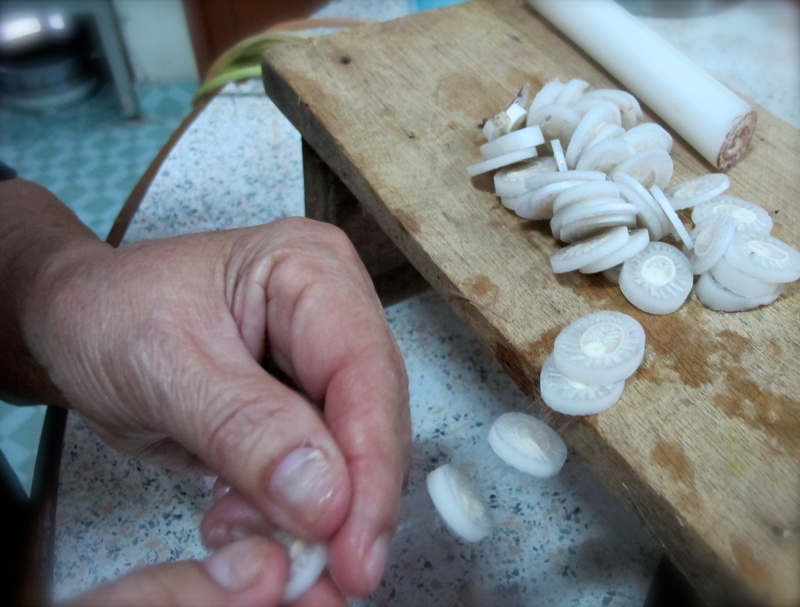 Then thinly slice pandan leaves. 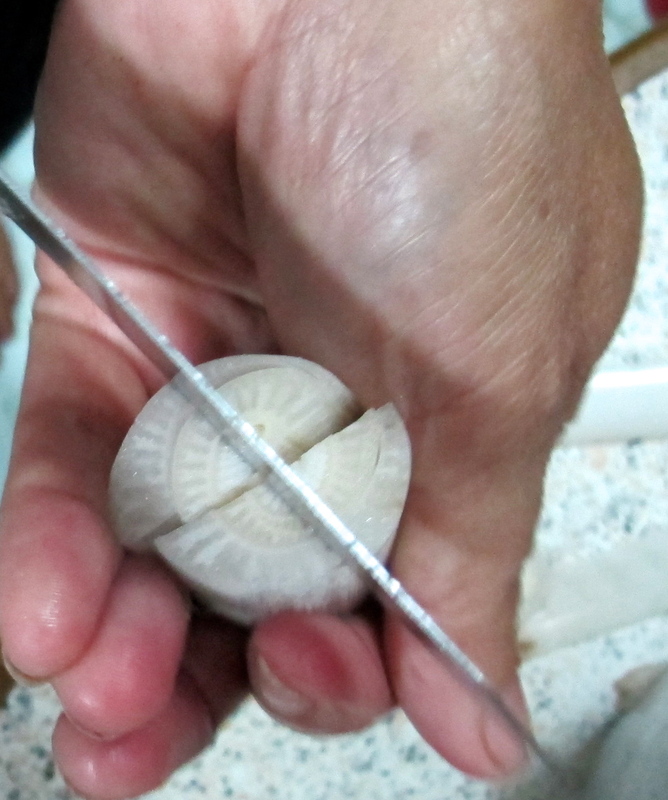 Place shredded pandan leaves into a mortar. 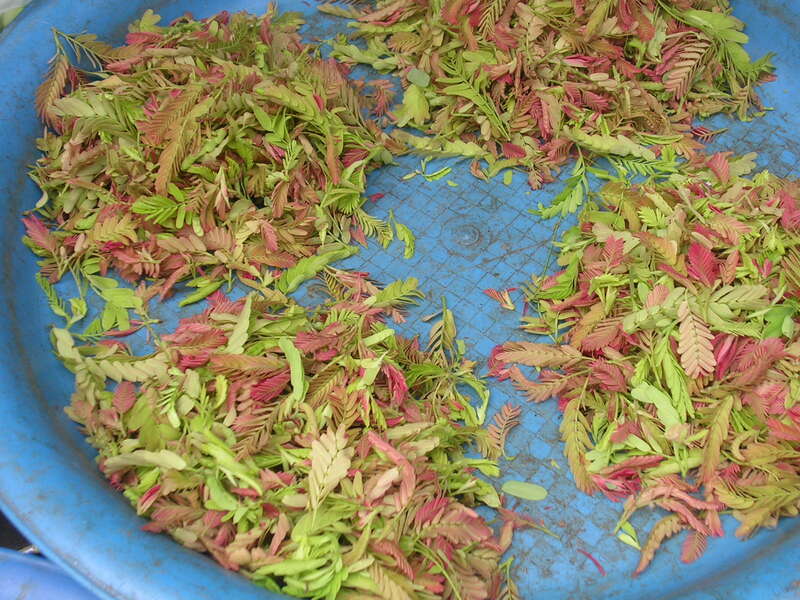 Pound the pandan leaves for about two minutes, until they form a paste. Stir in 5 tablespoons water. The pandan water is ready for any recipe that calls for green pandan extract. Alternative method: Place shredded pandan leaves and 1/4 cup water into a blender and blend for 30 seconds; strain, then discard the pulp. Tips & Techniques. For a green pandan water concentrate, let the pandan water sit for 15 minutes. About two tablespoons of green concentrate will sit on the bottom. You may use just this portion. The best way to make pandan water ahead of time or to preserve pandan leaves is to preserve the shredded pandan leaf in water and freeze the water and leaves together; the second best method is to make the green pandan extract and freeze it. When the whole leaves are frozen by themselves, it is easy for them to get a freezer burn or to dry out too quickly and lose their green color. When that happens I use the leaves for tea instead. Please see link below for my Pandan-Jasmine Tea Recipe. In Seattle, it is the re-sprouting of garlic chives from the ground that tells me every year that spring is here. 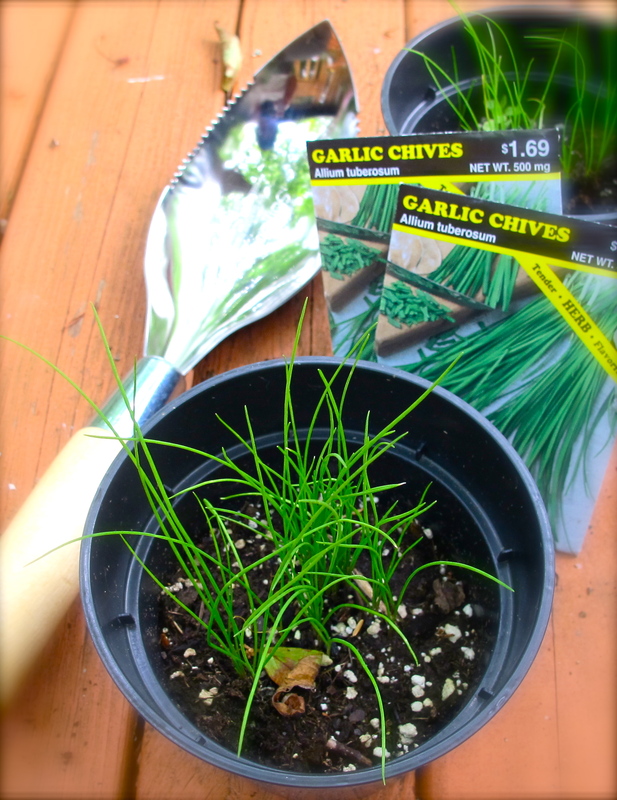 By April, I am enjoying my first harvest of garlic chives. Growing up with a rich Thai-Chinese heritage, garlic chives were always present in my family kitchen. We call it Gui Chai -กุยช่าย. Also known as Chinese chives, allium tuberosum is native to China and Japan, and widespread throughout Southeast Asia. 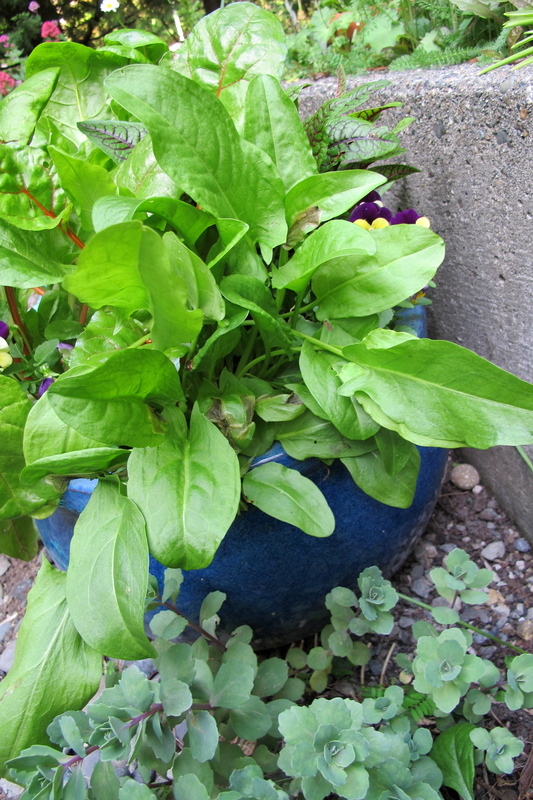 It is one of the many herbs that I enjoy growing in Seattle. It greets early spring every year around April, and in the fall, around September, the leaves die off. In warm climates like Thailand my family enjoys its long, flat green leaves all year round simply by cutting off a clump of chive stalks with a knife run close to the ground; two weeks later it will have grown up again. I can tell you from experience that garlic chives are easy to grow and delightful to have in your garden. A little bit of fresh garlic chives in your cooking will go a long way to providing an essential flavor of Southeast Asia. so I sowed 10 to 15 seeds next to each other. I love the fact that growing a few clusters of garlic chives inspired me to cook more with them. While waiting for one plant to re-sprout after cutting, I would cut a second one that had completely re-sprouted. The fresher the garlic chives, the sweeter and less pungent they are. They taste more like garlic than regular chives, and not at all like green onions. Don’t reject the pungent aroma of fresh garlic chives—after cooking they have a sweet and complex flavor with a delightful fragrance. Garlic chives are essential in Southeast Asian cuisine. In Thailand, they are widely used in stir-fries, dumpling fillings, rice pancakes, added to soups, as one stalk in a fresh noodle roll, and, most importantly, they are inseparable from the renowned Phad Thai noodles. But they are important in other cuisines as well. Recently, at Hue Ky Mi Gai restaurant in Seattle, a simple chicken broth with a few strands of garlic chives caught me by surprise. I was amazed at how much the garlic chives in a simple good broth enhanced the food experience of the Vietnamese cuisine. For this post I will focus on garlic chives and how we use them in dishes, and not talk about possible substitutions. It is the essential flavor from this long, green, flat-leaved herb that completes the taste and gives some classic dishes the flavor profiles that make them stand out in world cuisine. 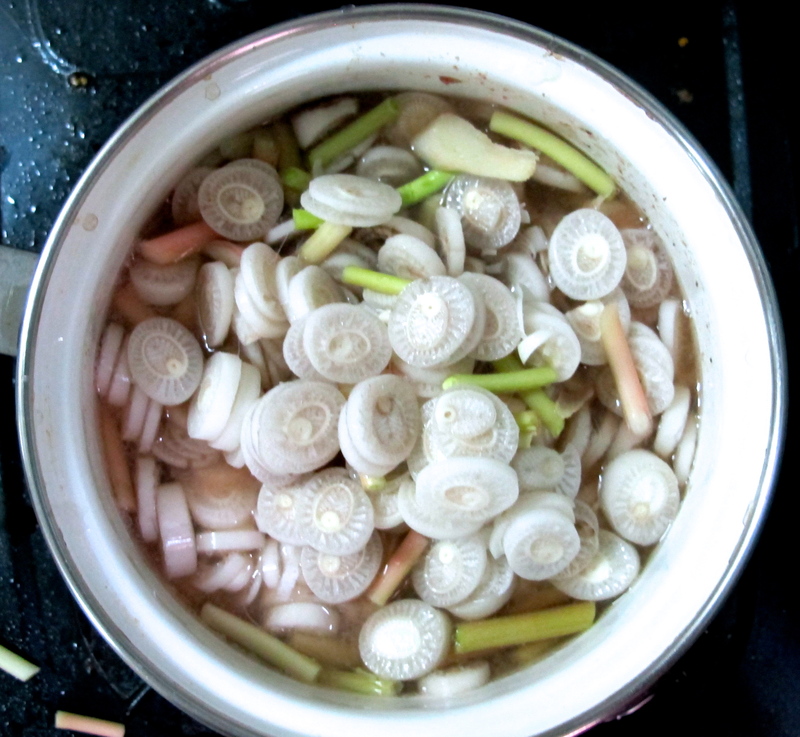 Garlic chives play a more important role in Phad Thai than non-Thais could imagine. It is a common fact in Thailand that we use garlic chives for Phad Thai and have done so since Phad Thai’s inception less than a hundred years ago. 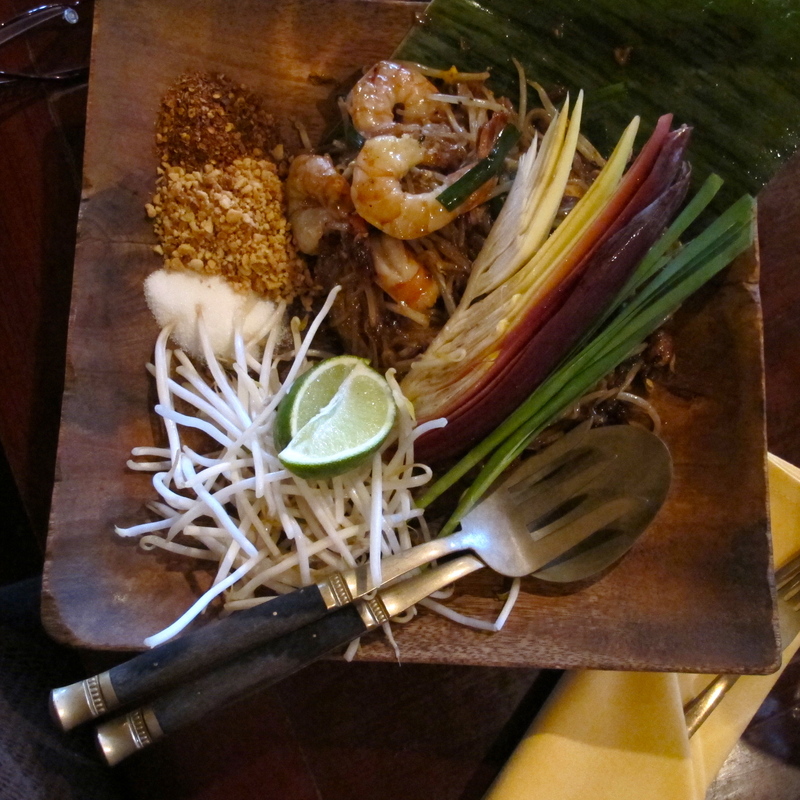 In a Phad Thai dish there is a balance of sweet, sour, salty and spicy. The incredible flavors of sweet from palm sugar, sour from tamarind, salty from fish sauce and spicy from chili are combined with one more element—bitter from garlic chives. 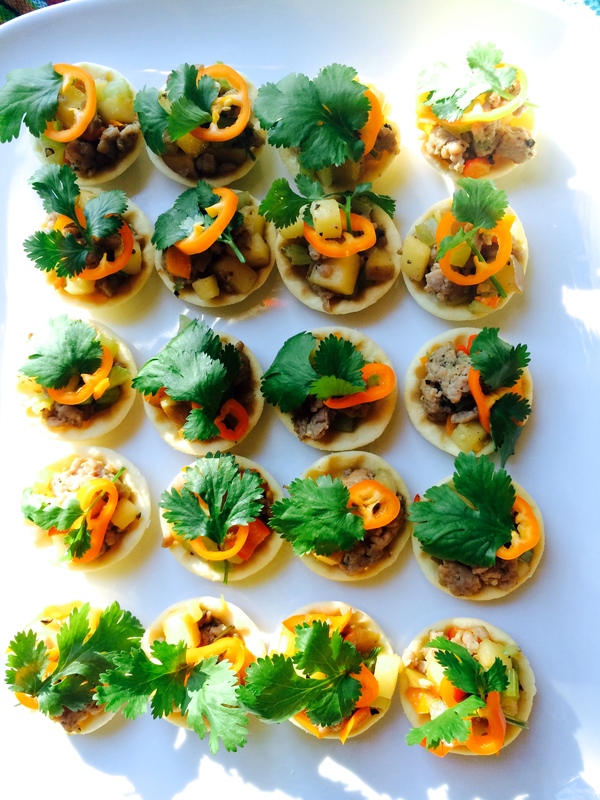 Together they build a complex and memorable flavor profile. Mung bean sprouts, tofu and garlic chives are classics for stir-frying. It is amazing to also see these same three ingredients in Phad Thai. 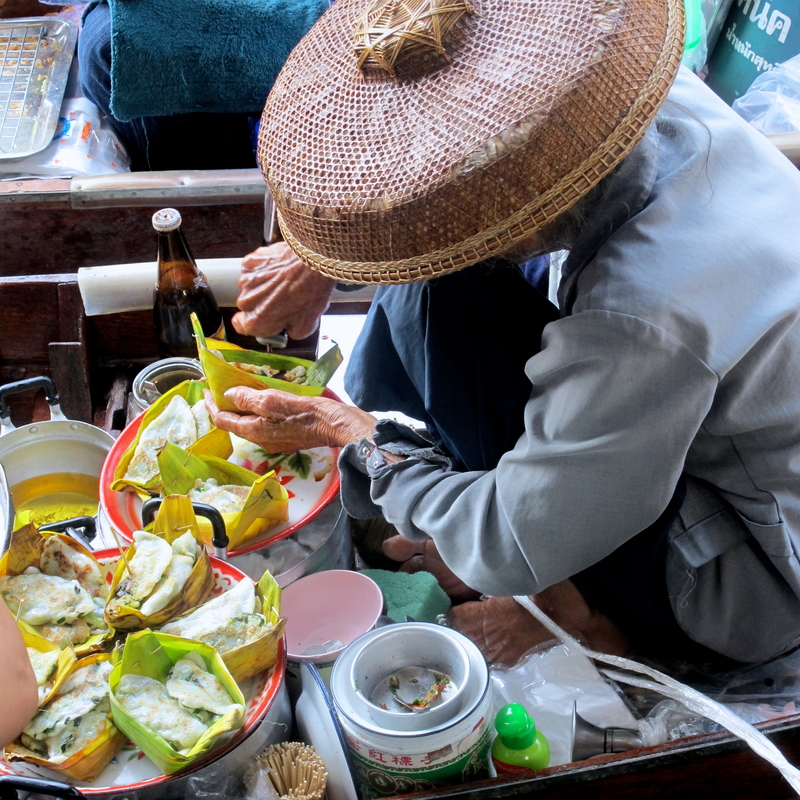 Khanom Gui Chai – ขนมกุยช่าย – is a street food and a snack that is very popular throughout Thailand. My photo above is from the floating market in Thailand where many Thai-Chinese families sells their specialties to locals. Garlic chives are stir-fried with soy sauce for a filling and the dumpling is steamed and fried. Before serving, a little bit of dark and light soy sauce is added as seasoning. Banana Stems – หยวกกล้วย – are considered a vegetable in Thai cuisine. 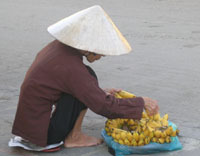 They are available everyday at wet markets and open-air-markets if you don’t have your own banana tree growing in your backyard or can’t get them from the nearby forest. Actually, the banana tree is not a tree at all. 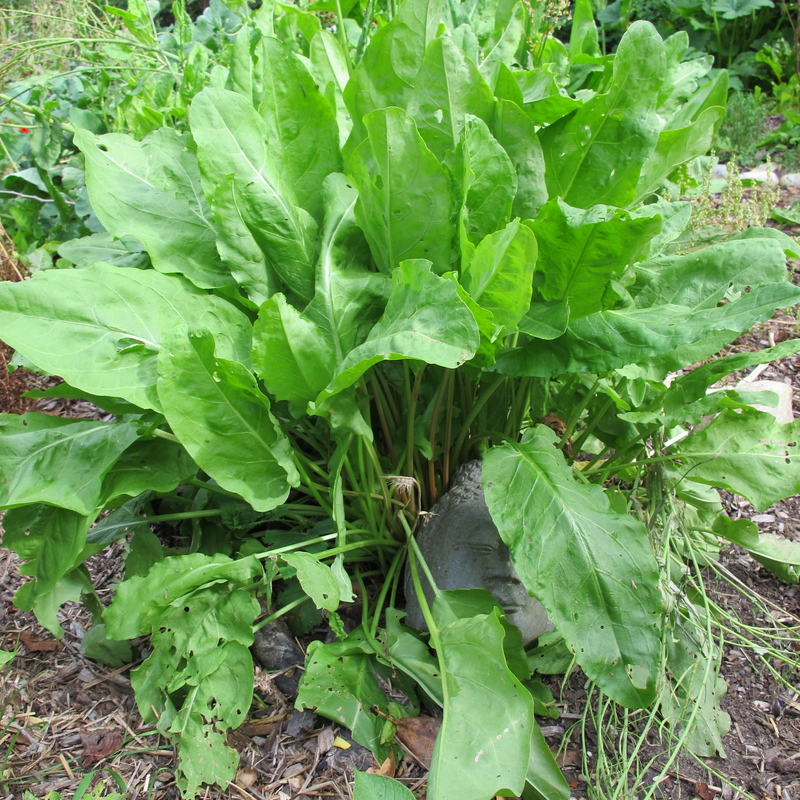 It is a giant herbaceous plant, with large leaves that closely roll up one over the other. Together they look like a trunk, but they are leaves from underground stems and they form only an “apparent trunk.“ Villagers in Thailand and many countries in South and Southeast Asia consider the tender core of the banana stems, the apparent trunk, a valuable nutritious vegetable. In Thai we call them, หยวกกล้วย – Yuak Kluey – Banana Stems. 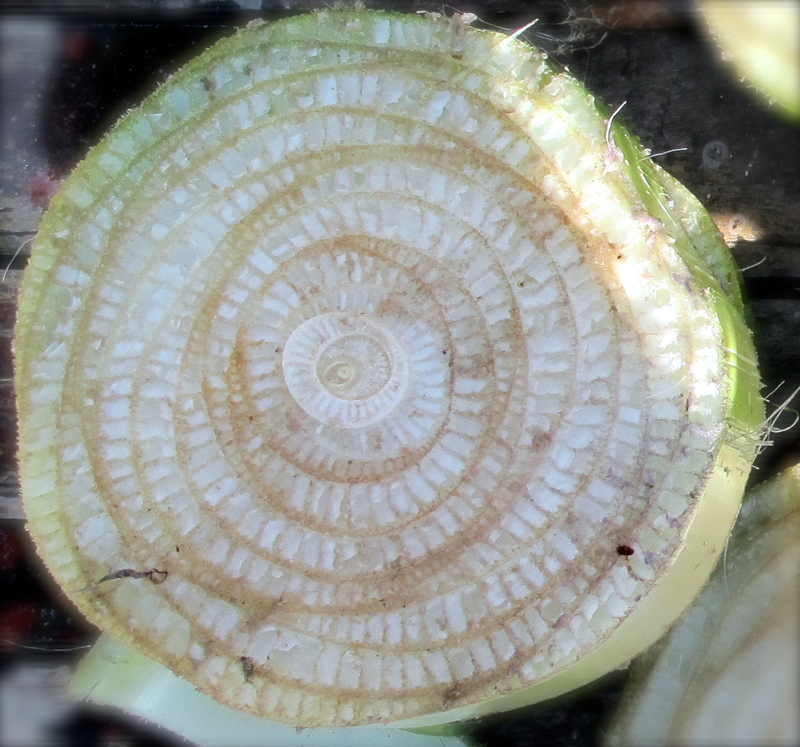 Each leaf can be peeled off. As you get closed to the center, you will find the most tender leave. Banana leaves closely rolled up one over the other. This is a cut from a five-month-old banana apparent trunk. Banana trees usually have about 15 to 20 leaves. Just like corn is used in the United States for both human and animal food, all parts of the banana plant—leaves, banana, banana skin, and roots—have minerals, vitamins, and fat. Thai farmers feed all parts of the banana to their pigs and farm animals. When I was in high school I had a pair of piglets. On the weekends I chopped down banana stems, cooked them with broken rice, and let them stew into a porridge before feeding them to the pigs. Farmers also mix chopped banana stems with other grasses during dry season for cows, goats and cattle—there are plenty of bananas in Southeast Asia. Banana stems are one-third edible vegetation and two-thirds water, but have a good amount of protein and fat plus minerals and vitamins. They are a good source of fiber, potassium, phosphorus, B6 and calcium, as good as the banana fruit itself. The stems are considered food in everyday cooking in Asia and Southeast Asia. 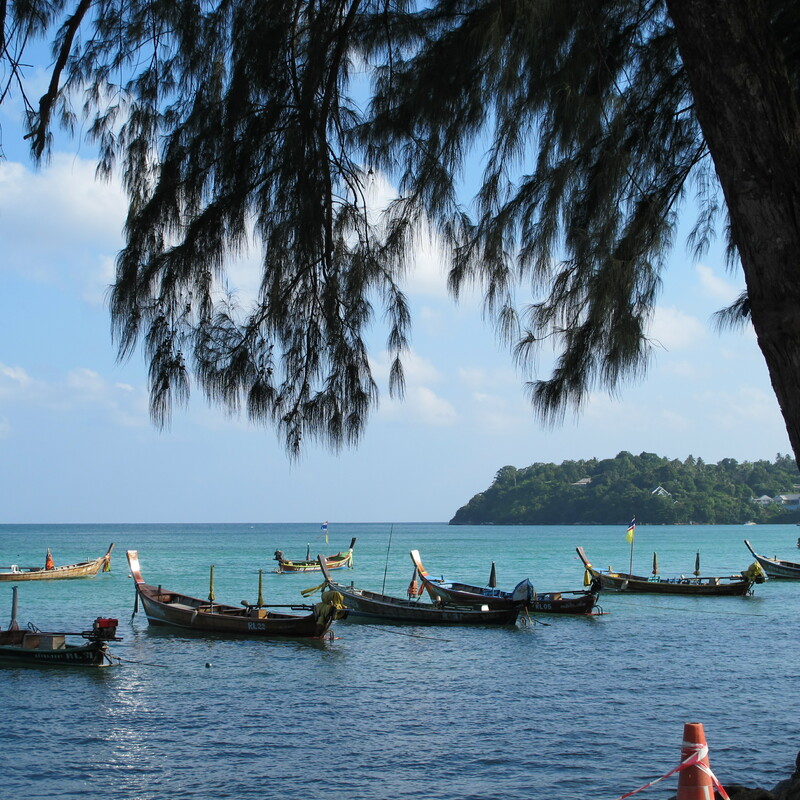 On Phuket Island, there are two varieties of bananas that have stems considered excellent for cooking. They are Kluey Nam Wah – กล้วยน้ำว้า – which are similar to apple bananas, and gluey pa – กล้วยป่า – wild bananas that are best for their delicious stems. In Phuket, it is typical for mountain- and hill-sides to be covered with wild bananas. 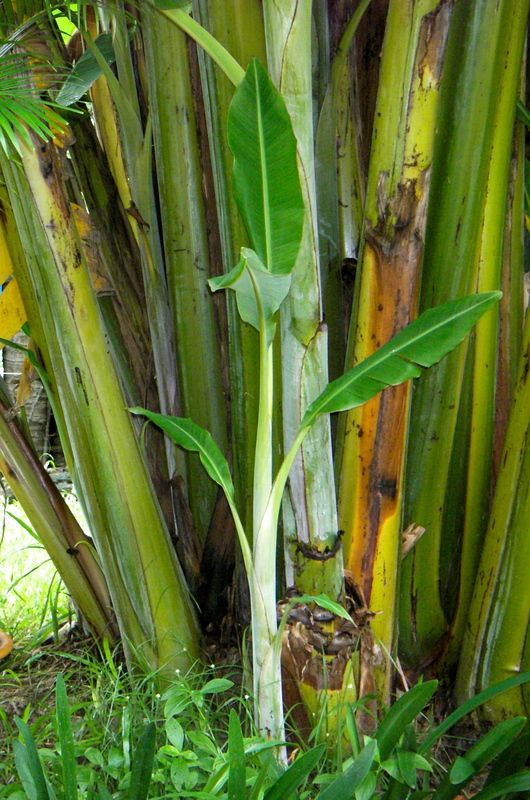 The best time to harvest quality banana stems for cooking is when they are about 3 to 4 months old, before the tree begins to flower and the core is still tender. 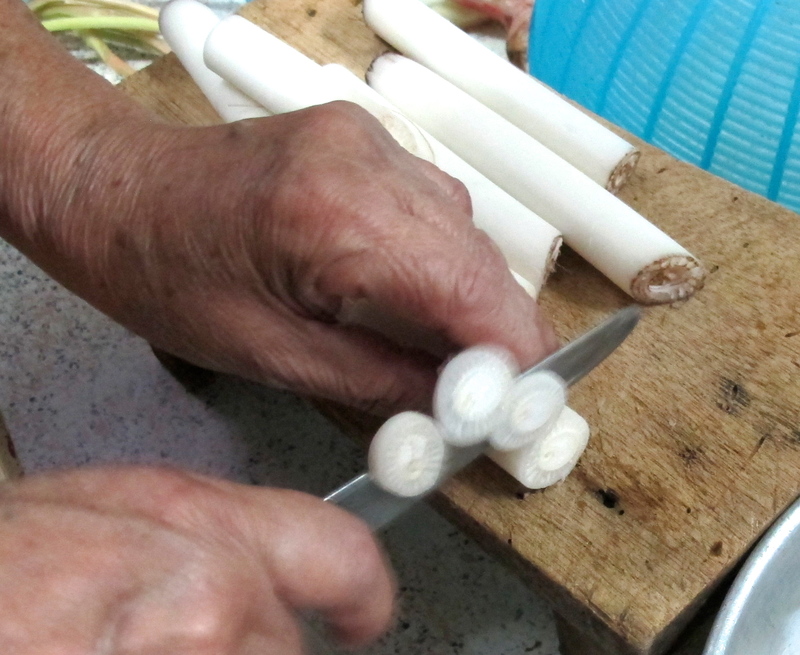 After banana stems are cooked, the texture is juicy, crunchy, and squishy, and the taste is sweet, tart, and bitter, plus their air pockets absorb the flavors of the other ingredients in the dish. I can’t compare the flavor of banana stems with anything else, but I can say that the texture and taste give me the same satisfaction as when I bite into Belgian endive. I would like to encourage you to try banana stems when you have a chance. If I were a banana stem, I would say that I am incredible, and that my taste, texture and nutritional value make me stand out with great personality. The dish that presents me is always memorable because of the incredible me! One morning last month I found my mom, sister, and sister in-law prepping and cooking together in the kitchen. I immediately grasped my camera and, trying not to interrupt everyone in the middle of the process, I took a snapshot of a real life in my Thai family kitchen. This is a typical vegetable soup of Phuket; it has been part of my mom’s new low fat, low sodium diet since she returned from the hospital. 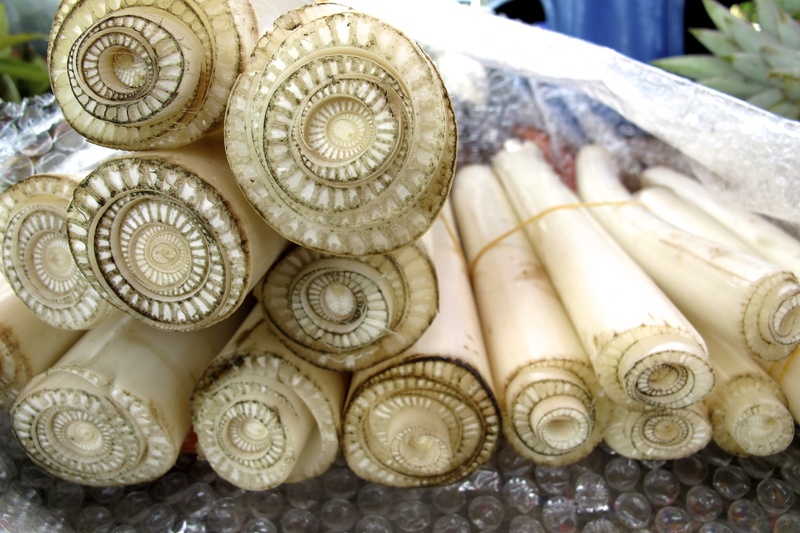 For this post, I will just highlight the banana stems themselves without adding a recipe in order to demystify the ingredients and cutting techniques, and help you to understand the amazing beauty of banana stems in Southern Thai cooking. 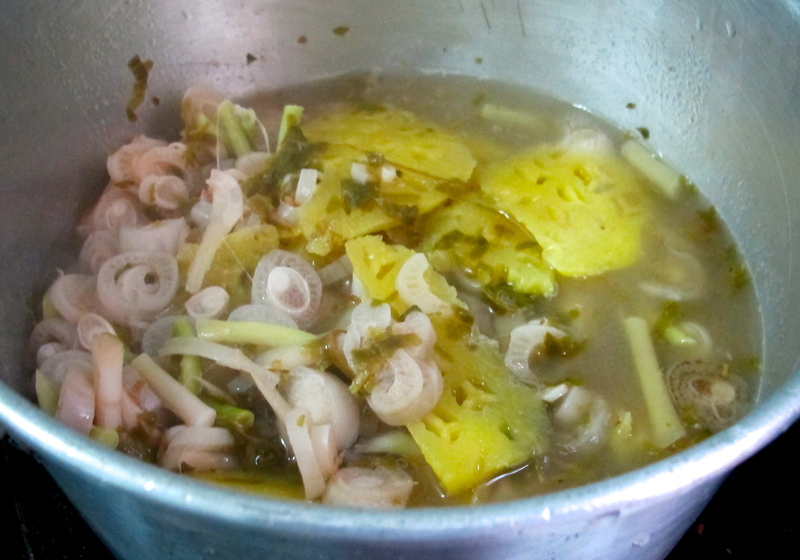 I was lucky that my family prepared banana stems two ways while I was there, one for soup and another for sour curry. I hope you enjoy a real cooking show from my mom’s kitchen. 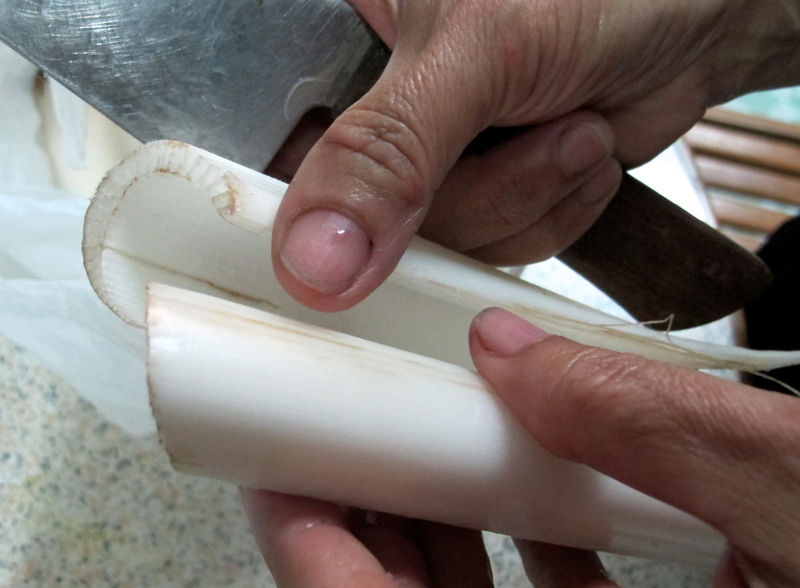 After purchasing the banana stems from the market, my mom removed the tough outer layer to get to the tender part. Use your index finger to remove the soft fiber strand or stringing. 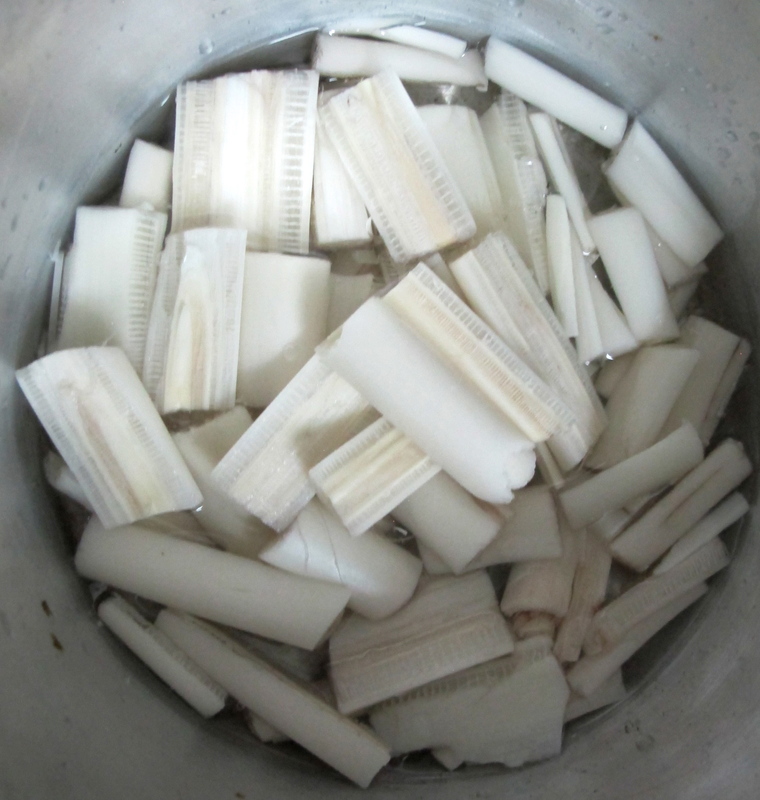 Soak sliced banana stem in a cold salted water or lime water for a short or long period of time, then it is ready to incorporate into a soup or stew. Cut into pieces about one and a half-inches in length. Then cut each piece lengthwise into four pieces as shown in the photo above. Keep the stems fresh and prevent browning by putting them in cold water with salt or lime juice, about 1 teaspoon salt or the juice of 1/2 lime for 4 cups water. 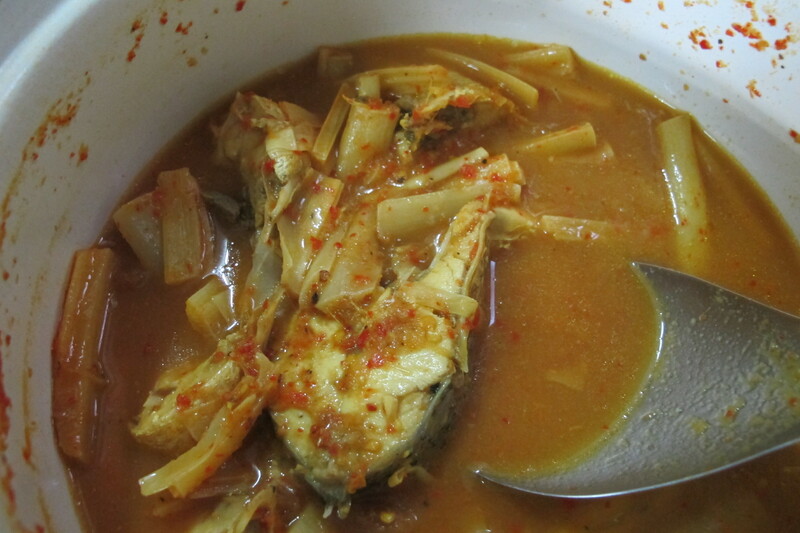 My sister cooked Gaeng Som Pla Yuak Kluey, Sour Curry with Fish and Banana Stems. After you learn how to prepare the banana stems step-by-step, now you need to encourage yourself to incorporate banana stems into these incredible dishes. 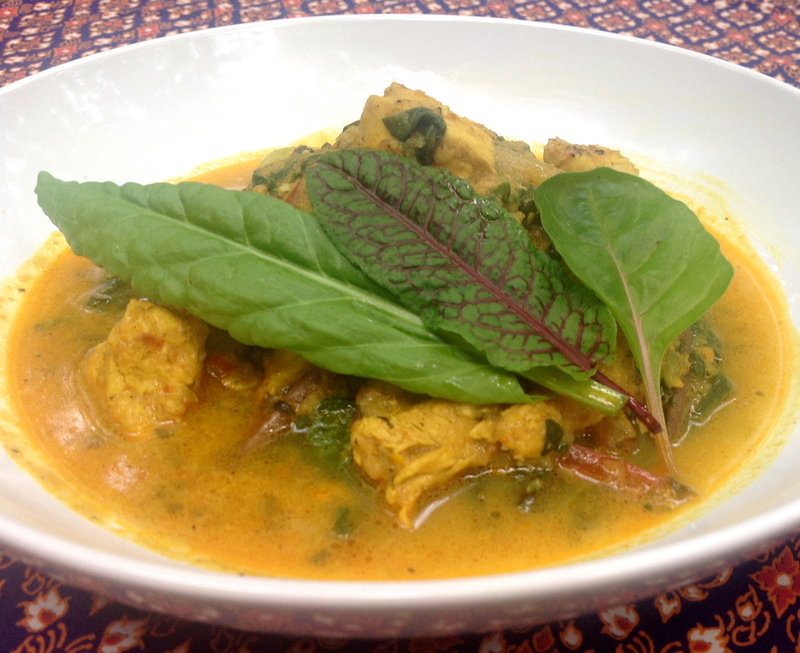 Here are my favorites: Phuket Tom Som (Phuket Sweet and Sour Vegetable Soup Recipe), Gaeng Som Moo Sam Chan (Surathani Pork Belly Sour Curry), Gaeng Yuak (Northern Thai Curry with Chicken, Gaeng Kati Gai (Thai curry Chicken with Coconut Milk). I would also not hesitate to try them in Tom Kha Gai. Buying and storing. Buy the freshest banana stems and cook within a day; with exposure to light and air they will keep growing and get tougher. One can store them in the refrigerator for a day or two, but I prefer to cook them as soon as I can to enjoy the best taste. The cooking time for banana stems is about 3 to 5 minutes. 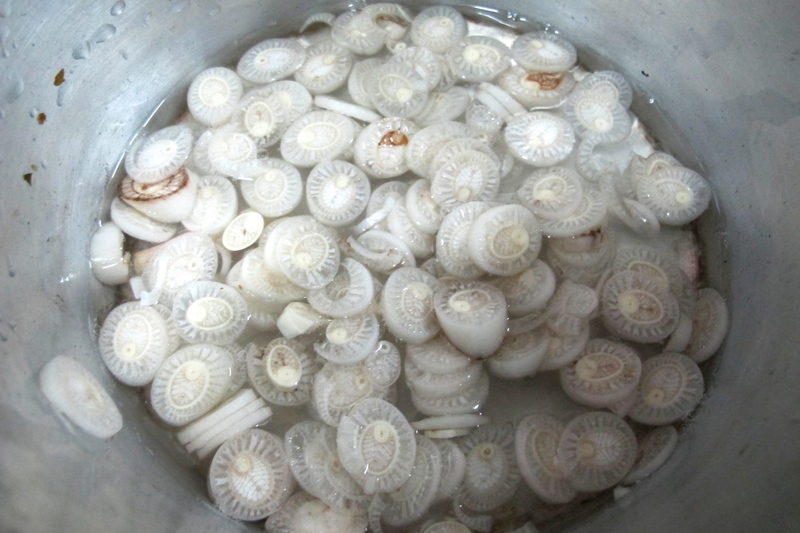 Keep them soaked in cold water with salt and lime juice until you are ready to cook.